Matervini is the new wine adventure of Santiago Achával and Roberto Cipresso. It was born in 2008, in an attempt to answer the question “what’s next after Malbec?” Our answer was, “More Malbec! From different places, with different personalities.” This venture shows how very different wines from completely different terroirs can be born from the same grape variety. Matervini travels the long path that goes from traditional to unexplored areas, from young to old geologies and from alluvial to non-alluvial soil structures - like those of the Pre-cordillera. All along this road, wines with unique personalities emerge as different expressions of nature. It is a path that starts with Wine made in traditional Mendocinian soils in the Uco Valley, that give the visitor the opportunity to try the flavors and personality of a classic and traditional terroir. This is the starting point where we can move to soils of adventure and discovery: Canota Valley in Mendoza, Calchaquíes in Salta, midway between Cafayate and Molinos, Yacochuya, in Cafayate, and lastly, returning to Mendoza, Piedras Viejas, in the area of El Challao, Las Heras, the first vineyard in Mendoza set on a pronounced hillside, with up to 13 thousand plants per hectare, planted at more than 5,000 feet above sea level with a great geological diversity in such a small area. Soils with calciferous rock more than 40 million years old, and others more than 450 million years old, and a third, of broken, weathered black basalt. All in less than 36 acres, in the middle of the Pre-cordillera. Here, in this last soil, a building is being constructed where we make six wines of the same intensity, but different geologies. The winery produces 40,000 bottles annually, among all the labels. 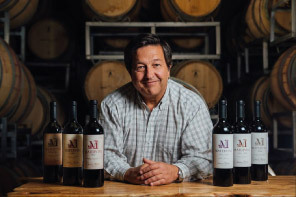 Santiago Achával, winemaker and founder of Matervini winery, first felt attracted to the wine world in 1988/89, when travelling with friends in Napa Valley. At the time, he was studying at Stanford University where got his MBA. Born in Italy, Roberto Cipresso went beyond his country‘s borders and brought to Matervini all the knowledge and experience acquired during his extensive career. 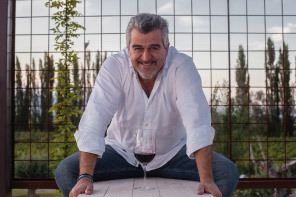 He is a Matervini co-founder and winemaker. Mercedes Palacio de Achával. Santiago’s wife, has a special role. She was the spirit of inspiration, the impetus behind the foundation and the indispensable support for concretion. Gabriela Lázaro. Operations and Logistics. Rather, almost everything. Franco Dionisi, Gustavo Biondo and Gonzalo Tapia. Hospitality and sales. A message that does not get communicated is a message that dies frustrated. They also transmit the Matervini message to all the visitors at each event. Cristián Centurión. In charge of the functioning and structure of sales, commercial sales and the design and strategy of direct sales. Traditional viticulture and modern sustainability in the vineyard and in the winery, come together in Matervini. In our winery all our electricity and heat needs are generated by solar panels. We also designed passive mechanisms to regulate temperature and decrease the total energy budget. We compost all our organic waste and return it to the vineyards. Matervini is a pioneer in using one hundred percent renewable energy sources.